Greenbriar Picture Shows: Was The King Tottering On His Throne? Was The King Tottering On His Throne? Lon Chaney On Stage? --- What Do You Suppose He Did? Clark Gable and Brod Crawford's doubles fight over Texas independence in a Metro said to represent the system on a slope and CG King-dom in decline (a Lone Star clip appears in the Dear Mr. Gable doc proposing just that). Actually this one's a pip, taken in right spirit. Give me old Hollywood in dotage any time. 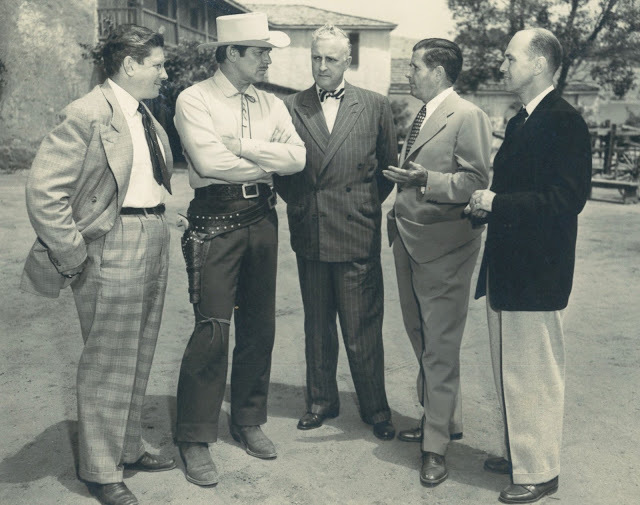 Gable had a deal for one outside pic per annum during his last MGM re-up, but never took it, Lone Star coming close (discussions were had), but kept on home lot for greater comforts accorded, or maybe sweetened terms for the star. Anyway, Vincent Sherman was tabbed to direct, not normally a Metro hire, having come up at Warners and now free-lance (he says in memoir Studio Affairs that he did Lone Star for $75K). Sherman recalled a bad script he was stuck with. Promises were made for a fix, but that never got done. Studio Affairs, a terrific Hollywood reveal, tells of pix hewed to schedules no matter a lack of prep time or proper story. In other words, go ahead and make your bad product and hope for the best. Sherman recall of Lone Star, and the movie itself, are as vivid a record as could be of mediocrity's acceptance amidst a system in decline. I was more entertained by elements gone wrong than few got right. For an action story, there's precious little, and most of that saved for the end (Sherman said they used the backlot as economy measure). Reliance on doubles for Gable-B. Crawford is to a point where stuntmen should have got screen credit, Gable sitting a horse before process screens, but seemingly no place else. 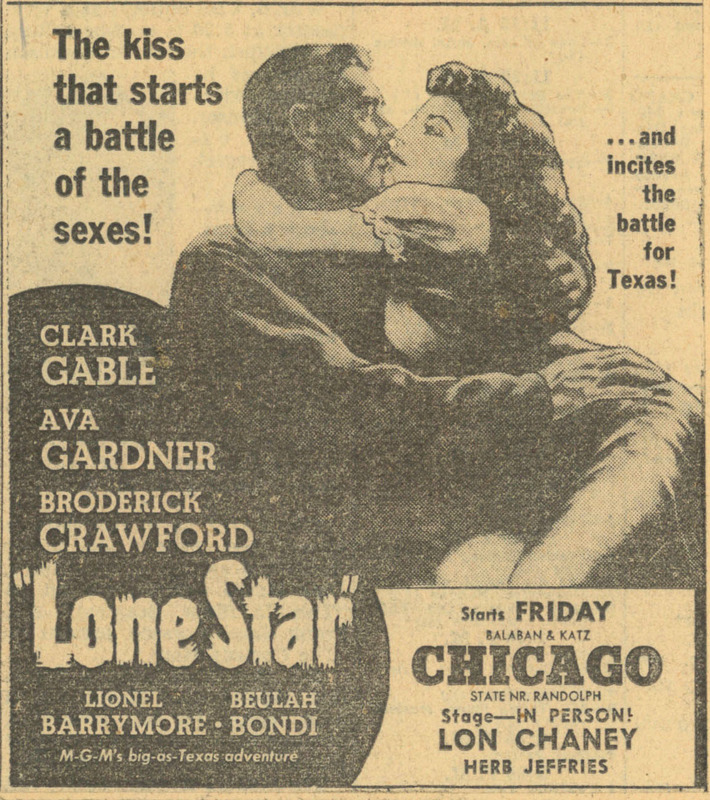 Lone Star was profitable despite deficiencies: a worldwide $4.1 million in rentals, which demonstrated how reliable action subjects still were, w/$1.1 million in profits ($1.6 million spent on the negative). Gable may have been perceived as slipping, but his vehicles still made money, and indeed only two for MGM after the war (Command Decision and Never Let Me Go) sustained loss. His popularity was too ingrained to ever really go away. Lone Star has played Warner Instant in HD, and is available from Warner Archive. Herb Jeffries, the Bronze Buckaroo, could sing. But what would Lon Chaney (Jr.) do during a personal appearance? In 1943, Chaney appeared on stage at one of my home town theatres for a War Bond Rally. 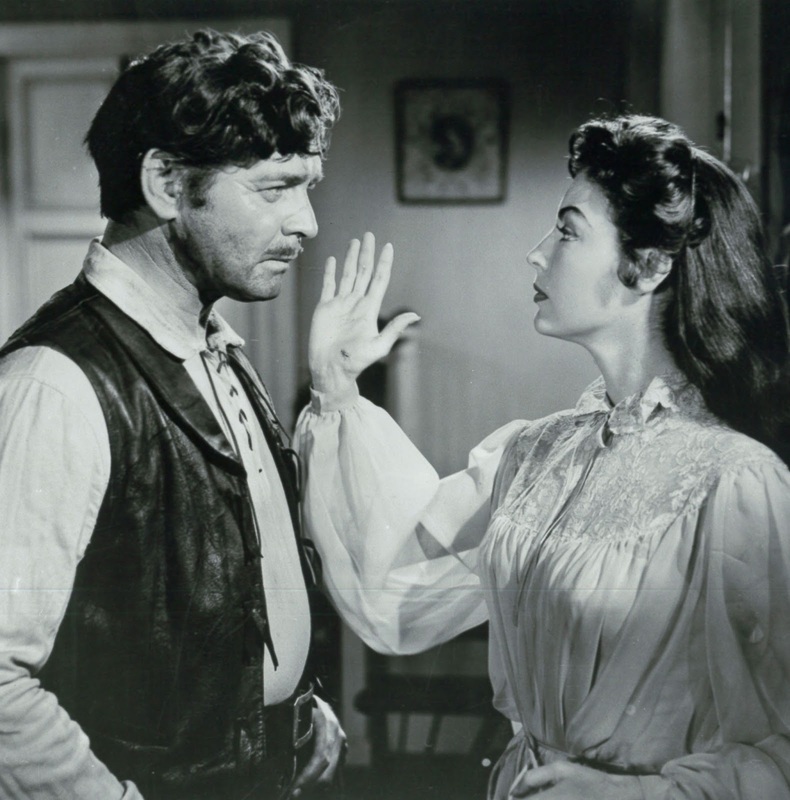 I will watch Gable when I see him on TCM, however whenever he is in a western I tune out. A 19th century cowboy movie character with a pencil thin mustache is ludicrous in the extreme. Gable could not change the brand. However I will watch this film when I can as it has Ava Gardner. That color photo is remarkable. Ava's been airbrushed down to the basement membrane, but every wrinkle, line and sag is unforgivingly on display on Gable's face. He's 52, but could easily pass for 70. A handsome 70, but 70 nonetheless. It's always been my understanding that Gable's shakes were due to alcoholism. By then, his contract (supposedly) stated that he ended shooting at 5:00, even if he was in the middle of a scene, because his hands would start shaking. His main rival, Gary Cooper, was said to watch every Gable movie, just to spot it. Perhaps that Parkinson's warning was just a cover. It was Vincent Sherman's impression that Gable had Parkinson's, based, I assume, on what others at MGM told him. I've always doubted that was the problem, however, and I'm not sure it was the drinking either. Gable did develop a tremor in the 50's, and it is visible in several of his films. I watched for it in "Lone Star," but didn't note anything. Others who are more observant might. with the few drugs they had even then to treat it. though, there are very few Gable movies I find as good as he is in them. Richard --- Yes, I never bought the notion that Gable had Parkinson's. He would indeed have been out of movies in short order if that had been the case. I agree that the war entered into it --- his enlisting was probably not a good idea, considering the fact he had to go through basic training, certainly a young man's ordeal, plus the missions that exposed him to real danger, and to little purpose beyond getting footage for a documentary that got less exposure than its considerable effort justified. I actually like the postwar Gables because these are the ones (really, the ONLY ones) I had access to growing up. I find his the late ones you mentioned, "Teacher's Pet" and "But Not For Me," to be exceptionally good, two of my favorites of 50's comedies. I only regret that Paramount has not done a fresh HD transfer of "But Not For Me," although "Teacher's Pet" does look wonderful on RetroPlex, and streaming on Vudu and Amazon HD. Aside from his early 30's classics, I NEVER liked ANY of the CRUDDY 1940's product MGM put out to begin with, and here MAYER had the GREATEST actor on his payroll and yet he NEVER, EVER put GABLE in ONE FILM LENSED IN TECHNICOLOR! Gable did much better after MAYER left, with "MOGOMBO", "BETRAYED", etc. His 2 for 20th century fox were winners in my book; and they WERE BETTER than ALL of that MINDLESS b&w home-studio JUNK they put him in made after "GWTW"(WHICH WASN'T MGM!). His post- MGM period was proof of his box office draw. I only wish that CLARK GABLE could have made a few more westerns. 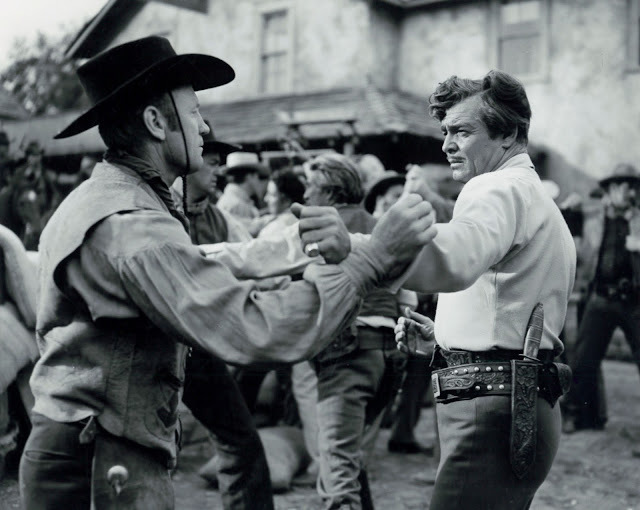 He LOOKED SO GOOD in the saddle in "THE TALL MEN"('55), one wishes there had been a sequel! If "THE KING AND FOUR QUEENS"('56) failed(? 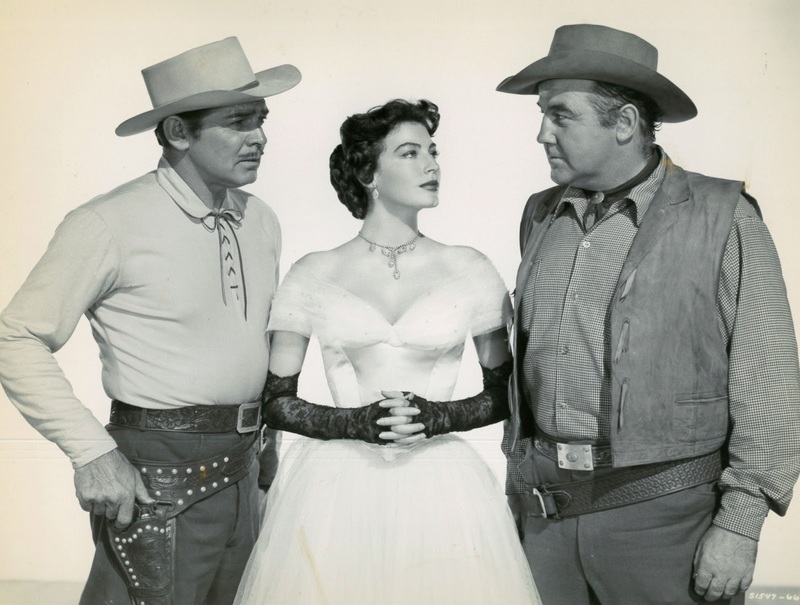 ), most likely it was because they( w/ director RAOUL WALSH) were both pretty exhausted after "THE TALL MEN" shoot; and WHO ELSE could have playing HANK LEE IN EDWARD DYMTRKS' "SOLDIER OF FORTUNE"('55) with more class than GABLE!? 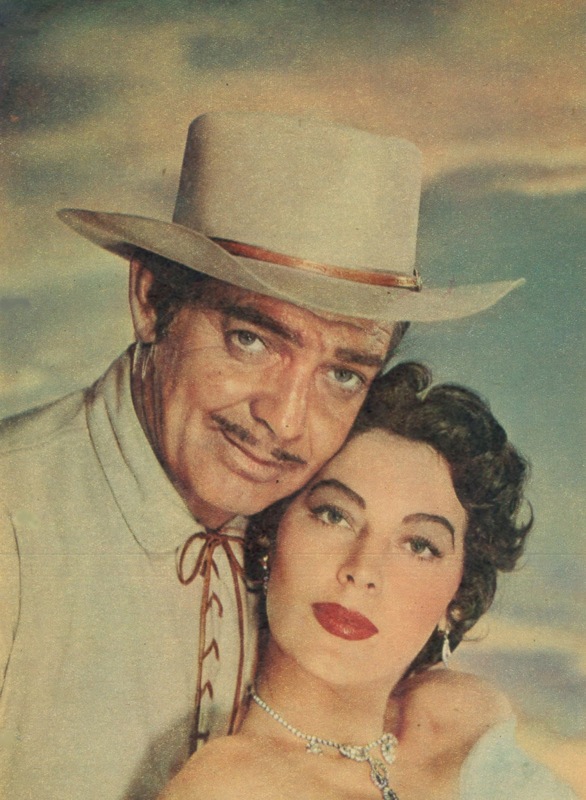 Unlike FLYNN and BOGART who were LOST after leaving WARNER BROS, GABLE SCORED MUCH BETTER here... and left us after making JOHN HUSTONS'CLASSIC,"THE MISFITS"('60).It was tragic he didn't live to see it's release.